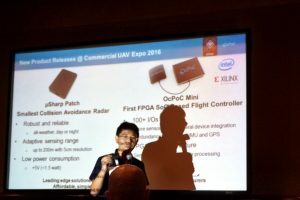 On November 1st at the 2016 Commercial UAV Expo in Las Vegas, Aerotenna unveiled two new, cutting edge sensing and processing products – µSharp Patch, the smallest collision avoidance radar, and OcPoC mini, the SoC FPGA-based flight controller for any UAV platform. 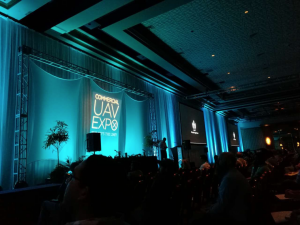 With more than 2000 professionals and 150 exhibitors in attendance including Intel, Airbus, 3DR, PrecisionHawk and Airware, the popularity of the expo shows the increasing demand for smarter drones with greater capabilities for commercial applications. One of the most critical and sought after solutions is collision avoidance, and Aerotenna’s µSharp Patch grabbed the spotlight and the interest of users, manufacturers and service providers alike. This microwave radar patch is an affordable, low power and easy to integrate collision avoidance solution for even the smallest drones. Its miniaturized radar antenna, circuitry and signal processor package provides robust and reliable performance with adaptive sensing range and centimeters resolution. This radar solution for collision avoidance could be the key in fulfilling sense and avoid requirements for fully autonomous drones. A consensus amongst industry experts is the ideal sensing solution consists of a combination of sensors. Therefore, the flight control system must be able to integrate multiple sensors and perform sensor fusion to enable quick and reliable collision avoidance. OcPoC mini, Aerotenna’s SoC FPGA-based flight controller, was engineered with exactly these requirements in mind. With over 100 I/Os for sensor integration and redundancy, a powerful ARM processor and FPGA structure, OcPoC mini has the processing power and efficiency to enable sensor fusion and real-time onboard processing for safe flight and complex applications. Just like the µSharp Patch, OcPoC mini can be easily integrated with any airframe and open-source flight stack. 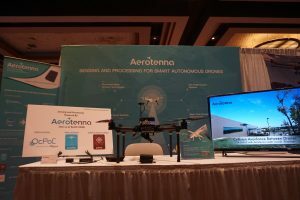 Aerotenna’s µSharp Patch and OcPoC mini show that powerful solutions can come in small packages, and once again demonstrate Aerotenna’s mission to set new standards for UAV sensing and processing.